On Monday March 28, 2016, the First Family hosted the 138th annual White House Easter Egg Roll. This year's theme was “Let’s Celebrate!” and more than 35,000 people joined us on the South Lawn for games, stories, and, of course, the traditional egg roll. In addition to all the fun and games, the day's activities — which included sports courts and cooking demonstrations — celebrated the initiatives of First Lady Michelle Obama and the contributions the Obama Administration has made to the Easter Egg Roll. In honor of the First Lady’s Let’s Move! initiative, this year’s event will also include the first-ever White House Fun Run. 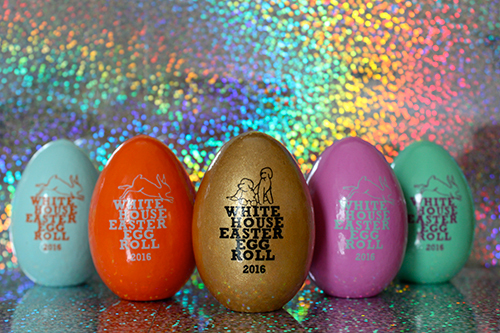 The National Park Foundation (NPF), the official charity of America’s national parks, produces and sells the commemorative White House Easter eggs. Each child 13 years and younger who attends the White House Easter Egg Roll on the South Lawn will also receive a souvenir egg. The eggs first became part of the tradition in 1981, when President and Mrs. Ronald Reagan hosted a hunt for wooden eggs that bore the signatures of actors, actresses, famous politicians, and athletes. One of last year's winners. 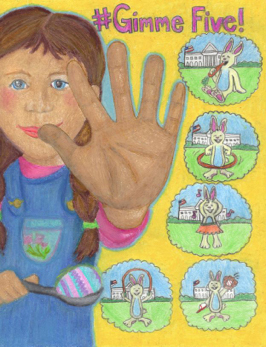 The White House invited all elementary and middle school students to submit original artwork related to this year’s theme for the 2016 Easter Egg Roll Design Contest. The First Lady will select the winning designs, which will be used as part of the White House 2016 Easter Egg Roll program and souvenir poster. The theme for this year’s event is “Let’s Celebrate!” to honor the final Easter Egg Roll of the Obama Administration, and celebrate the initiatives of First Lady Michelle Obama. The design contest is now closed. The White House Historical Association presents a look back at the White House Easter Egg Roll from 1898 to 2002. 2015 White House Easter Egg Roll: Calais Campbell Reads, "Curious George"
2014 White House Easter Egg Roll: Debby Ryan Reads "Curious George"
2014 White House Easter Egg Roll: Nina Davuluri Reads "The Giving Tree"
2013 White House Easter Egg Roll: The Wanted Reads "Caps for Sale"
2013 White House Easter Egg Roll: Danica Patrick Reads "Go, Dog. Go!" 2013 White House Easter Egg Roll: Julianne Moore Reads "Freckleface Strawberry"
2013 White House Easter Egg Roll: The First Family Reads "A Sick Day for Amos McGee"